These Crisps managed to be firm, thick and munchy, yet the overwhelming quality was a crispy and loud crunch. The deterioration was timed very well, with the gradual decline of crunch timed through to the end when it just turned mushy right before swallowing. 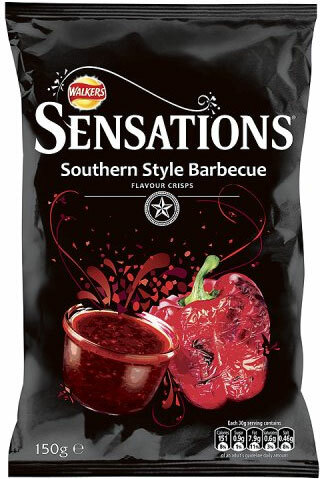 Unlike most Sensations Crisps, these appeared to be relatively flat. There were very few of the curly and bendy Crisps that are usually identifiable with the batch frying process. There were oil boils, but nothing substantial and there were glassy oily patches. The colouring was a nice yellow infused with orange coloured flecks. A Nose Plunge Test revealed a tough of Vinegar up close. But when the bag was placed down there was still an aroma of some description evident from two feet away. We were intrigued by the claim that they were 'Southern' Style Barbecue. Does this mean Cornwall, The Isle of Wight, even Jersey? Or are we to presume Walkers owners, and Texas based FritoLay, are inviting us to accept that the term 'Southern' relates to their neck of the woods? That presumptuous arrogance aside, what about the taste? Well, there was something meat like in there, sort of like Beef. There was also a quite pleasant mild flavouring added to it, but it was not spicy, hot, sweet or sticky. Overall, a nice Crisp, but nothing too memorable within the genre.